I’ve really been trying to eat more yogurt, and more fruits and vegetables. It’s not that I don’t like these things, in fact I actually really love them – its just that sometimes I forget how good they are. I figured having granola around would be a perfect way to insure I’d eat both yogurt and fruit in the morning. If I have some awesome granola in the pantry, how could I pass up a fruit, yogurt and granola parfait for breakfast? I’ve tried a bunch of granola and I’ve learned that some granola should actually be in the grocery store right next to the “Cookie Crisps” cereal, because it offers about the same nutritional value. I’ve got nothing against Cookie Crisps, but if your trying to make yourself a healthy breakfast, don’t be tricked by some “healthy” granola impostor at the store. 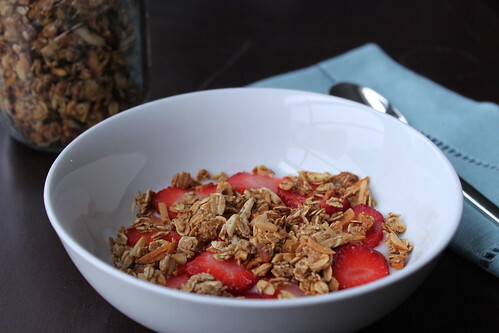 This granola actually is healthy, and the flax seed really helps to up the nutritional value. Flax seed adds some fiber, and it’s the best source of Omega-3 fatty acids you can get – but you barely notice it’s there. You could definitely try upping the amount used if you’re feeling adventurous. I found mine in the same aisle as the flour, and it’s sold at most grocery stores. A lot of granola recipes call for dried fruit, but since I tend it eat this with yogurt and fruit anyways, I like mine plain. Preheat oven to 300º. Mix the brown sugar, honey, applesauce and oil in a small bowl or a measuring cup. In a large bowl, stir together oats, almonds, salt, cinnamon, ginger and flax seed. Add the applesauce mixture to the dry ingredients and stir to moisten all the oats. Spray a cookie sheet with cooking spray, and spread the granola evenly on the sheet. Place in the oven for 30 minutes, then remove, and flip the granola using a spatula, cook for 20-25 minutes more. Remove from oven, and let cool on the cookie sheet. It will still seem a little moist when you first removed it from the oven, but will crisp more as it cools. This entry was posted on April 8, 2011 by Spice Is Nice. It was filed under Breakfast .